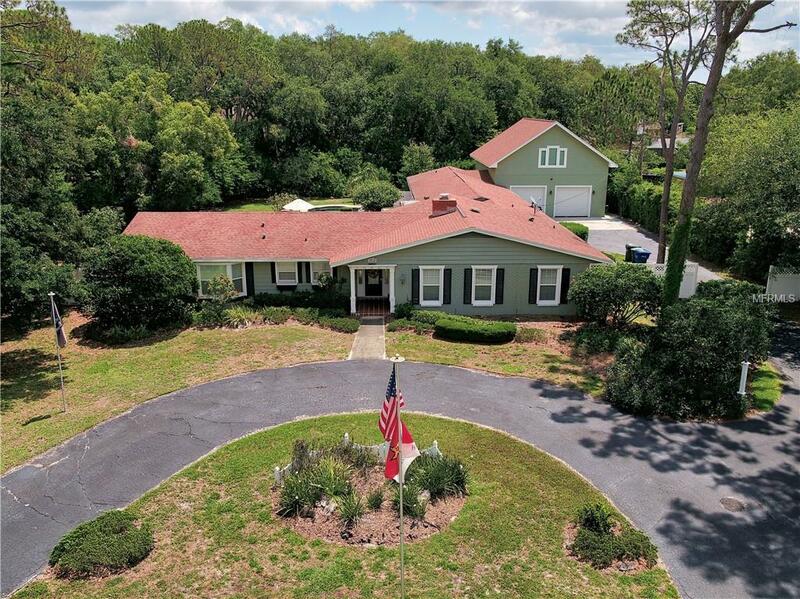 This remarkable property includes a traditional 2/3 updated home, detached 3/1 guest house with living room and kitchen and a spectacular six car mechanics garage with 2 car lifts and two second floor finished rooms. The large lot with fenced backyard allows plenty of privacy for the outdoor brick patio and pool set on a brick paver deck plus a two car carport. The main house features a large living and dining room with wood burning fireplace. There is an electric fireplace flanked by built-in cabinetry in the family room with French windows and a French door opening to the brick patio. The white kitchen, with breakfast bar and two pantry closets, has been updated with granite counters and stainless appliances including a five burner gas cook top. The laundry room has two year old appliances. The second bedroom has a French door to the patio, and there is a nearby hall bath with a tub/shower and custom vanity with glass shelves. The master bedroom retreat includes French doors to an adjoining study, an electric fireplace, French door to the patio and his and her walk-in closets with built-ins. The master bath offers a soaking tub and a shower along with a granite topped dual sink vanity and enclosed water closet. Guests or in-laws will love using the one floor six room guest house with a dining area in the full kitchen overlooking the pool. The mechanics garage features two Bendpak four post car lifts, sink, compressor, half bath and two zones of a/c.